Occupying a superb position in this exclusive, gated, marina development, enjoying a convenient yet highly secure setting within easy level walking distance of Events Square, the town centre and harbourside, an impeccably maintained and presented 3-storey house, providing light, spacious and well appointed 3 bedroom, 3 bath/shower room accommodation, enjoying intriguing and ever-changing views over the entrance to the marina, marina basin, along Campbeltown Way, and across Falmouth Harbour to unspoilt countryside beyond. Constructed circa 2000, being the final phase of the Port Pendennis marina development, Campbeltown Way is a secure, gated community, perfectly positioned for Falmouth's amenities, all of which are 'on the doorstep'. Number 17 occupies a superb position at the head of Campbeltown Way, directly overlooking the lock gates to the marina basin, with the rear-facing rooms and balcony having panoramic views over the head of the marina to Challenger Quay opposite, and across the active waters of the inner harbour to the outskirts of Flushing and unspoilt Trefusis Headland beyond. The front-facing rooms and balconies enjoy a particularly sunny south-westerly aspect with the complementary view along Campbeltown Way to the nearby National Maritime Museum and town beyond. Beautifully maintained and faultlessly presented throughout, the gas centrally heated and hardwood framed double glazed accommodation briefly comprises: a sheltered entrance porch, deep reception hall with turning staircase rising to the galleried landings over, cloakroom/WC, ground floor double bedroom with en-suite bathroom, together with doors onto a part covered patio situated almost immediately adjacent to the entrance to the marina. The living accommodation is provided at first floor level with an extremely spacious L-shaped living room with broad balcony off the lounge area, together with double small pane casement doors from the dining area opening into a full breadth and comprehensively appointed kitchen/breakfast room, with further balcony off. At second floor level, there are two further large double bedrooms, one with a square bay window to the marina and harbour, the other with a further balcony, both of which, again, have private en-suite bath or shower rooms, one of which has a 'Jack and Jill' arrangement for use by visiting guests if preferred. 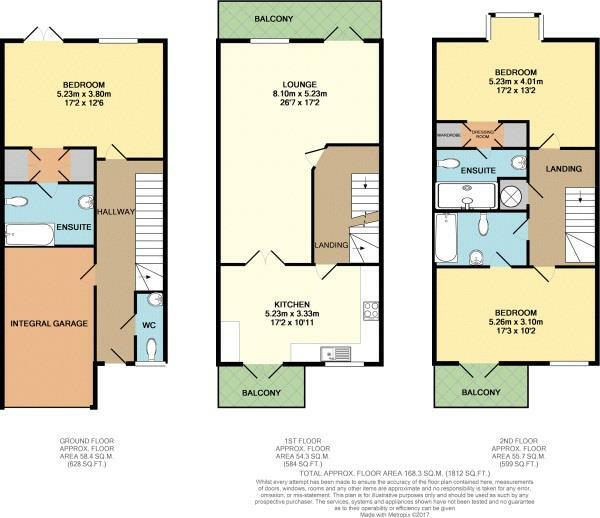 Furthermore, other houses of this type in the marina have a four bedroom configuration and, if required, bedroom three could be sub-divided, subject to consents. With the additional benefits of an integral garage, allocated parking space and immediate vacant possession upon completion, we strongly recommend interested prospective purchasers arrange an early viewing appointment. Falmouth needs little introduction, having been voted as one of the best places to live anywhere in the UK over the last two years by readers of The Sunday Times. Campbeltown Way occupies a discreet yet highly convenient position, just yards from the National Maritime Museum and Events Square, allowing for the town's excellent range of retail, commercial and leisure amenities to be readily accessed by foot. Mooring facilities within the marina and on the outer pontoon are on application from the marina manager, with those in the harbour available on application from the harbour master. Dinghy launching facilities are available at Grove Place with laying-up and maintenance at Falmouth Marina, a variety of other boatyards, as well as at Mylor Harbour on the western shoreline of the Carrick Roads. Regular bus and train services provide direct and easy access to the cathedral city of Truro, approximately twelve miles distant, with direct main-line rail link to London (Paddington). Coved ceiling, timber flooring, staircase with turned balustrade and hardwood handrail leading to the part galleried first floor landing over. Broad walk-in under-stair storage cupboard. Radiator, telephone point, panelled doors with moulded architraves. Coved ceiling, extractor fan, timber-effect flooring, radiator. White two-piece suite comprising a low flush WC and corner wash hand basin with tiled splashback. Electronic up-and-over door, cold water tap, electrical trip switching. Light and power connected, courtesy door to the entrance hall. A very well proportioned ground floor bedroom with coved ceiling, radiator, TV aerial socket and telephone point. Window and double casement doors opening onto the sheltered patio with views beyond to the marina and harbour. Attractively appointed with a white three-piece suite comprising a low flush WC, pedestal wash hand basin and panelled bath with hand grips and mixer tap with shower attachment. Ceramic tiled flooring, coved ceiling, extractor fan, strip light/shaver socket, radiator, part tiled walls. Part galleried with turning staircase with turned balustrade and hardwood handrail continuing to the galleried second floor landing. Overlooking the head of the marina, Port Pendennis, Challenger Quay, lock gates, gate house and across the harbour to the outskirts of Flushing and the unspoilt countryside of the Trefusis Estate. Exterior light. Another extremely well proportioned room with window and further casement doors opening onto a south-west facing balcony overlooking Campbeltown Way to Events Square and the town beyond. Coved ceiling, telephone point, TV aerial sockets, timber flooring. Comprehensive range of cream-painted Shaker-style wall and base units with ample beech worksurfaces between with complementary tiled splashbacks and concealed pelmet lighting. Glass-fronted display cabinet, wine rack, AEG four-ring ceramic hob with illuminated concealed filter canopy over and AEG oven/grill below. Inset stainless steel sink unit with mixer tap and cutlery drainer, integrated AEG dishwasher. End display shelving, wall mounted Radiant gas fired boiler providing domestic hot water and central heating. Integrated fridge and freezer cabinets, and Hotpoint washer/dryer. Again, galleried and with high quality panelled doors with moulded architraves. Coved ceiling, access to over-head loft storage area, radiator. Large built-in airing cupboard with Flowmaster unvented cylinder, timer switching and slatted linen shelving. Central heating thermostat. Second measurement reducing to 9'8 (2.97m). Coved ceiling, radiator, telephone point and TV aerial socket, square bay window with stunning marina, harbour and countryside views. Complementary white three-piece suite comprising a low flush WC, pedestal wash hand basin and broad walk-in shower cubicle with sliding glazed screen and mains-powered Mira shower. Ceramic tiled flooring, strip light/shaver socket, coved ceiling, extractor fan, radiator, part ceramic tiled walls. Again, featuring a white three-piece suite with low flush WC, pedestal wash hand basin and panelled bath with hand grips, mixer tap with shower attachment and glazed screen. Coved ceiling, extractor fan, ceramic tiled flooring, radiator, part tiled walls. Further doorway onto the second floor landing should a 'family' bathroom arrangement be preferred. Providing a further outside sitting/dining area; enjoying views over the entrance to the marina in one direction and the harbour in the other. Part covered with the lounge balcony over. Exterior lighting, power point and double doors from the ground floor accommodation. In addition to the integral garage, there is an allocated parking space within easy level walking distance of the front of the property. Leasehold - 999 years commencing 2000. Maintenance charge: c. £2,000 (for the current year (2018/2019) to include buildings insurance, the upkeep of the communal gardens and periodic external redecoration, etc. Restrictions: we understand both long term and short term holiday letting are allowed in the development, but pets are excluded, unless with the prior permission of the management company.